My second attempt at exploring Mexico City's Historic Center was much more fruitful than the first. Well rested and ready for another big day in the capital, I worked my way from east to west across the Centro Historico, a UNESCO World Heritage Site. Most of the museums in the historic center open at 10 AM, and I began small with the Museo Mural Diego Rivera, located on Plaza Solaridad, near Alameda Park. The main draw is Diego Rivera's mural entitled “Dream of a Sunday Afternoon in Alameda Park” which features an eclectic cast of characters including the artist himself, his wife and fellow artist Frida Kahlo, and a depiction of death itself (the skeleton wearing a dress in the middle). Maps describing all of the characters in both English and Spanish can be found at the opposite end of the room. It's a fun exercise going through them all to decode what you're seeing. Leaving the Diego Rivera museum, I walked east through Alameda Park. Given how overwhelmingly large Mexico City can feel, it's a pleasant surprise to find an oasis of green in the middle of all the action. There are plenty of water fountains and park benches, and few vendors, though a market is set up on weekends. At the east end of the park is Palacio de Bellas Artes (The Palace of Fine Arts). 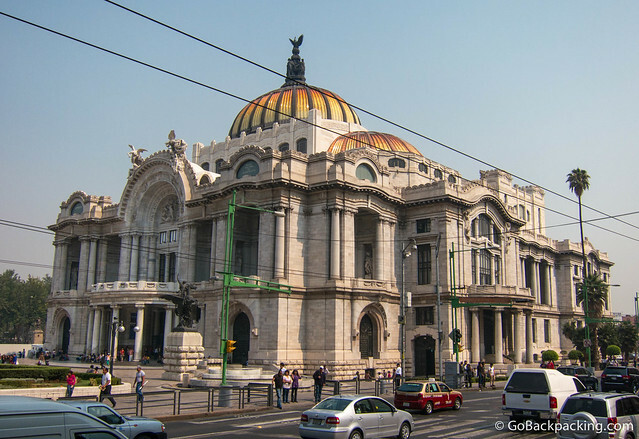 The grand building houses a theater where the Mexican ballet performs. The second and third floors feature more Diego Rivera murals, as well as works by other artists. Plus, there's additional gallery space for smaller installations. Even if you choose to forgo paying the museum entrance to see the murals, step inside and take a gander at the impressive lobby. 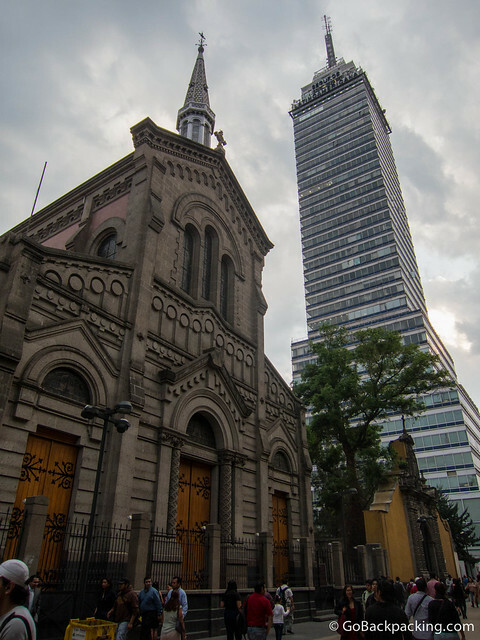 Visible from the Palacio de Bellas Artes is the 182-meter tall Torre Latinoamericana, one of Latin America's iconic skyscrapers. For those visitors who want a view from the top, admission is 60 pesos, or about $4.65. The lookout is open 365 days a year. I continued east, walking seven blocks along the pedestrian-only Avenida Francisco I. Madero. This passageway is filled with shops, restaurants, and old churches. 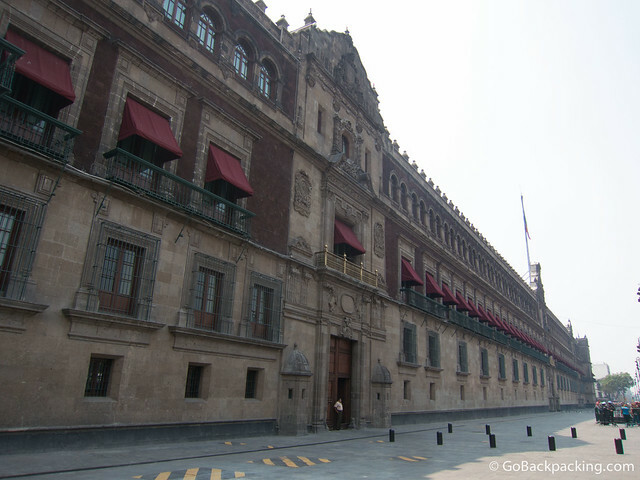 At the eastern end, it spills out into the Zócalo, or main plaza, which is the epicenter of the historic district. Here, one's eyes are immediately drawn to Catedral Metropolitana, the largest church in North and South America. Inside, you'll find a monumental golden altarpiece close to the front door, for what I believe to be small services. During both my visits, I was not allowed to walk the length of the nave, and to my knowledge, it's not possible to climb the spires. The Zócalo is also ground zero for tourism in Mexico City. North Americans, especially, take advantage of cheap holiday packages. Bringing together the value of backpacking with the comfort of an organized holiday, these trips can provide a great introduction to those who are new to travel abroad. 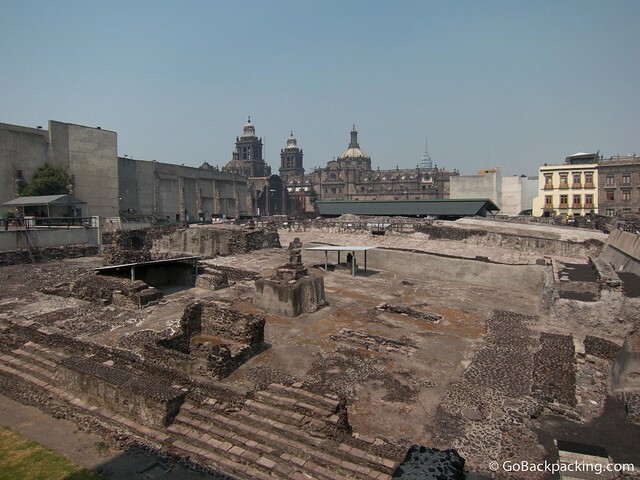 Adjacent the Cathedral is Templo Mayor, an important temple belonging to the ancient Aztecs. The earliest construction dates back to the 14th century, and it was later destroyed by the Spanish in 1521. Its discovery, and full-scale excavation did not occur until the late 20th century. Not knowing of Templo Mayor before my walking tour, it was a fascinating experience to stumble upon an archaeological site of this significance in the city center. A modern museum housing related artifacts was built on site, and admission is included with the 57-peso ($4.40) entrance to Templo Mayor. Exiting Templo Mayor, I walked over to the National Palace, across the street, and occupying the eastern side of the Zócalo. 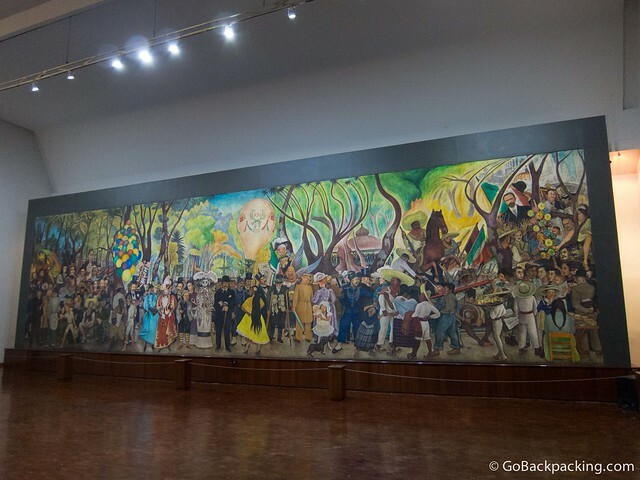 The highlight of the palace visit is a viewing of Diego Rivera's “The Epic of the Mexican People” depicting Mexico's history. There was an event going on when I stopped by, and thus I lost my last opportunity to visit before leaving the city. Next time, Palacio Virreinal will be tops on my “to do” list. I'd allotted the first half of my day to seeing the city center, and after 3-4 hours, I'd seen a lot. I hailed a taxi and headed for my 2 PM lunch at Pujol. 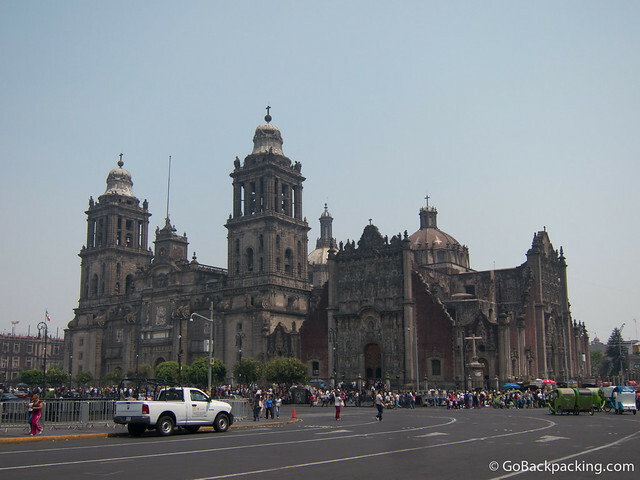 The Historic City Center of Mexico City became a World Heritage Site in 1988. They sure have done a number on that Alemeda, it is really nice now. We managed to see that mural too a few weeks ago, and as my first Diego mural, It was awesome. It was my first Diego mural too, and then I saw a few more at the Palacio de Bellas Artes. I’m a fan. I also need to watch “Frida” again. Templo Mayor really looks fascinating, Every cathedral and temple has an amazing architectural design. Parque Alameda really highest beauty in Mexico City’s.The Alameda Central park is a green garden. 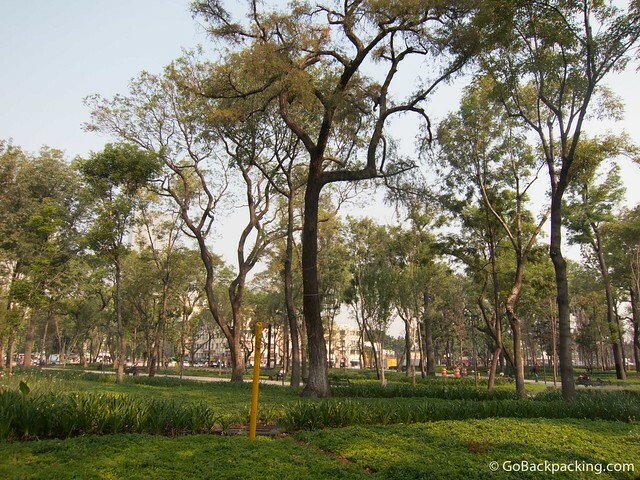 In this Parque Alameda you can find paved paths and decorative fountains and statues. Some magnificent buildings here. How far would you say it is in distance to cover these?